i have only recently discovered the fun of butter puff pastry! i know, i know i admit i have been under a rock of sorts! truth be told, i thought they were full of all sorts of yucky ingredients, but it actually isn’t. i found some easy all-ready-to-go frozen puff pastry at the grocery store and left it out to thaw for a couple of hours. i followed the instructions on the package, and recommend you do the same. 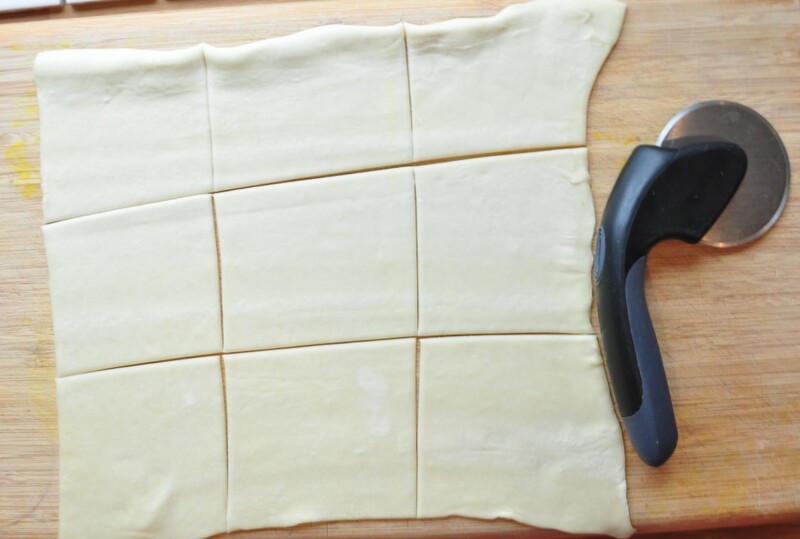 i used a pizza roller to divide the puff pastry sheet into 9 somewhat even squares. 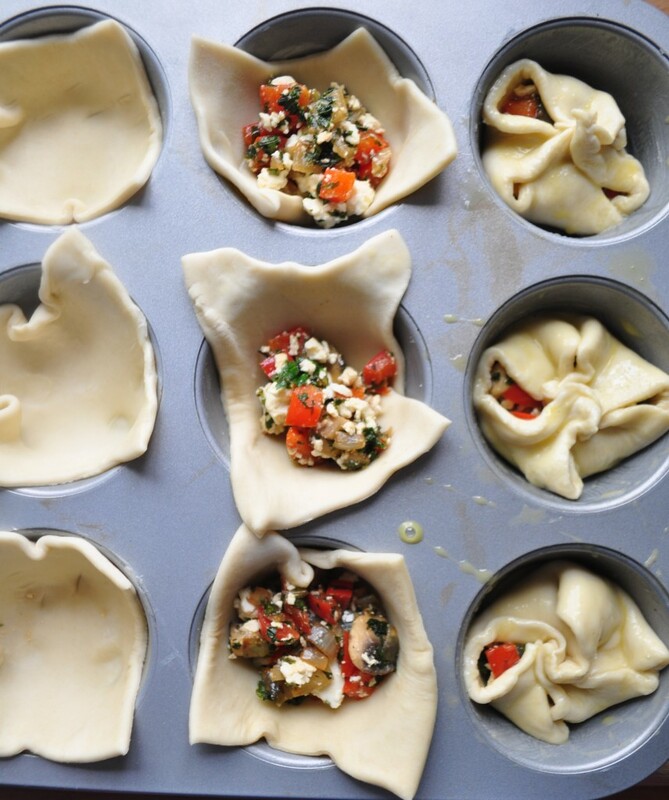 they really don’t have to be perfect at all, as the pastry sheets can be pulled to fit your muffin pan if necessary. also, as you’ll see once the pockets are stuffed with the filling and you’ve twisted the tips of the corners together, that having perfect squares is not that important. 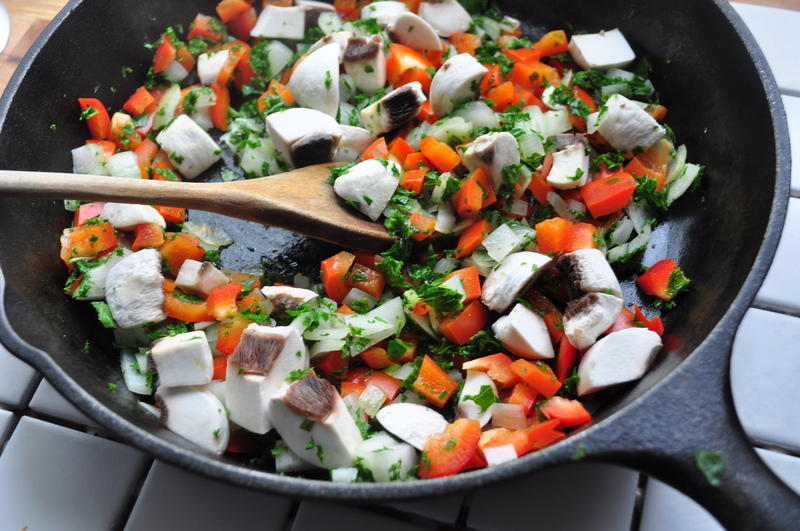 i sauteed my veggies in my skillet to bring out the yummy flavours in them before baking them in the oven. then in a bowl i mixed the sauteed veggies and chunks of feta cheese. prepare your muffin pan by greasing it up. i like to use real butter that i spread into each muffin slot with paper towel, other’s may prefer to use cooking spray. then place a puff pastry square into each slot, gently pushing down. fill each pocket with about a tablespoon of filling, take all four corners and twist them together. 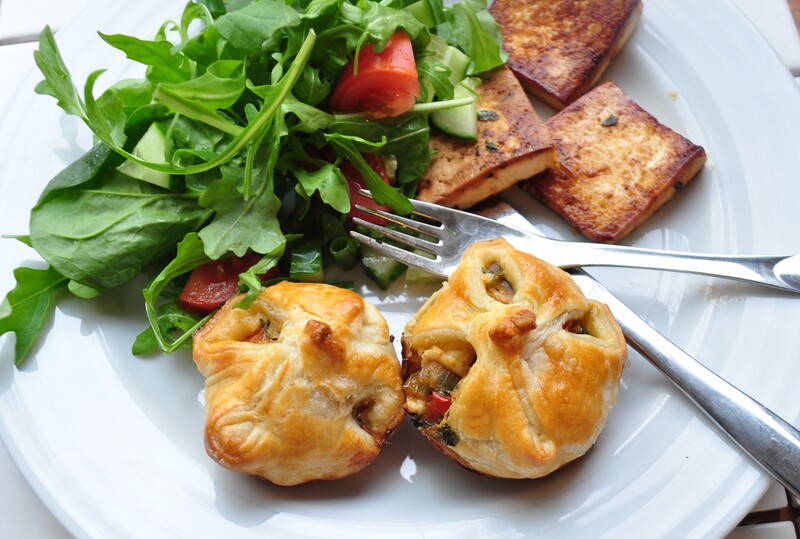 finally, brush of some whisked egg to add a nice golden shine to the baked vegetable puffs. is your mouth watering right now? 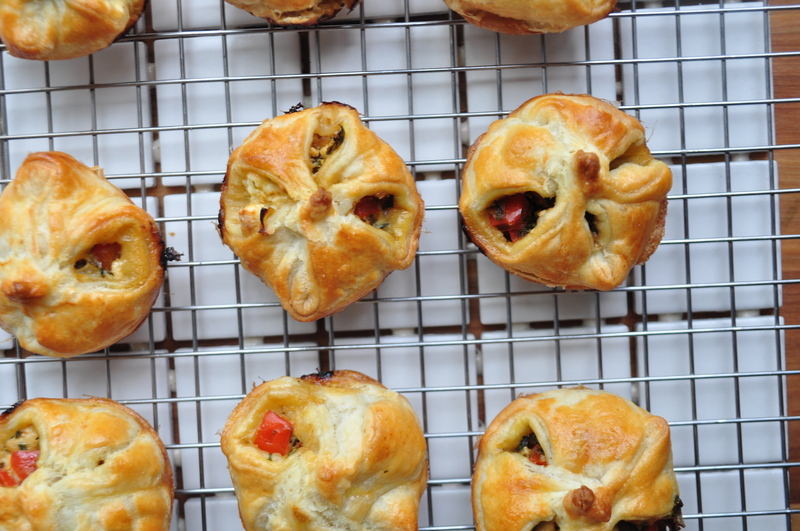 don’t these wee vegetable puff pastry bites look amazing? they really so easy to make and a perfect add on to so many different meals! all of my three guys love to take these to work and school for lunch the next day… that is if we have any left over! haha! on this day we had tofu steaks and and lovely green salad with them! yum! 1. thaw the puff pastry according to directions on the package. 2. preheat the oven to 350F. chop onions, garlic, mushrooms and peppers finely into small pieces. 3. heat a skillet, add olive oil and sautee onion and garlic until tender. add peppers, mushrooms, pepper, salt and finally fresh basil leaves. 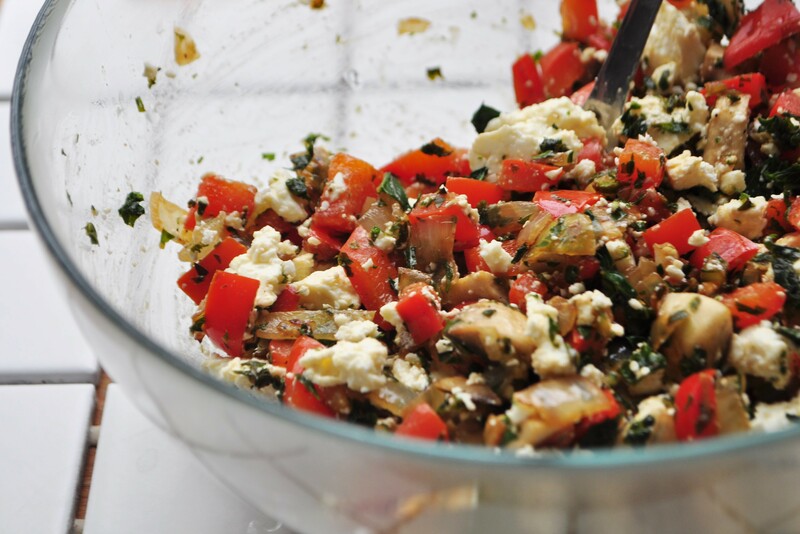 4. once basil leaves have lightly wilted, in a separate bowl add feta to sauteed veggies. mix well, ensuring feta chunks are smallish. 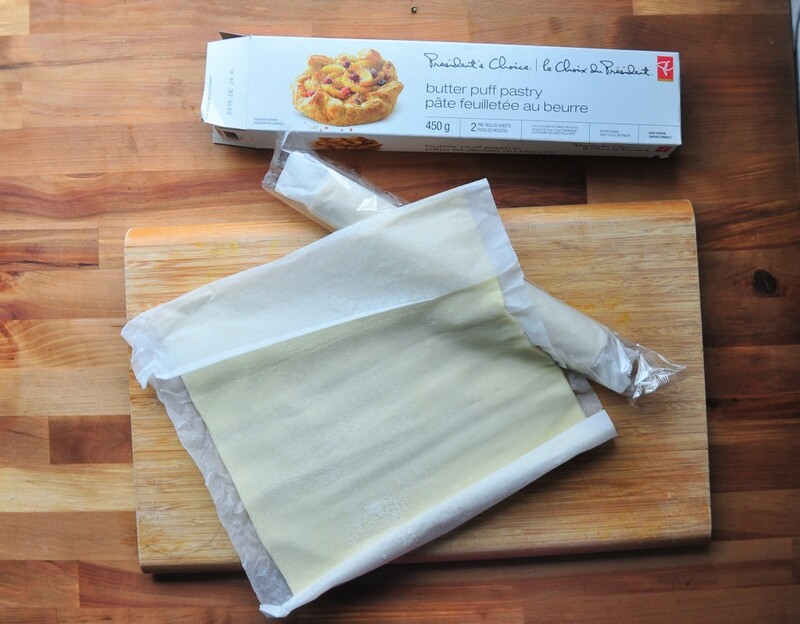 5. divide thawed puff pastry sheet into approximately 9 squares. grease your muffin pan. place each square into the muffin pan, add approximately a tablespoon of filling, twist the corners of the squares together to ensure the filling stays inside. brush whisked egg on top of each veggie bite. 6. bake for 15-20 minutes or until golden brown on top. let me know how the recipe works for you! love the simplicity of this recipe, definitely going to try them on my day off.